Plasmolifting Centrifuge XC 2000 is a lab instrument specifically meant for the preparation of platelet-rich plasma (PRP) using the Plasmolifting protocol. This low speed centrifuge delivers the optimal centrifugal force to effectively separate whole blood samples into the desired fraction containing high concentrations of platelets as well as growth factors and cytokines that is used in bone and tissue healing enhancement procedures. Plasmolifting Centrifuge XC 2000 is a centrifuge used for preparing ready-to-use PRP. 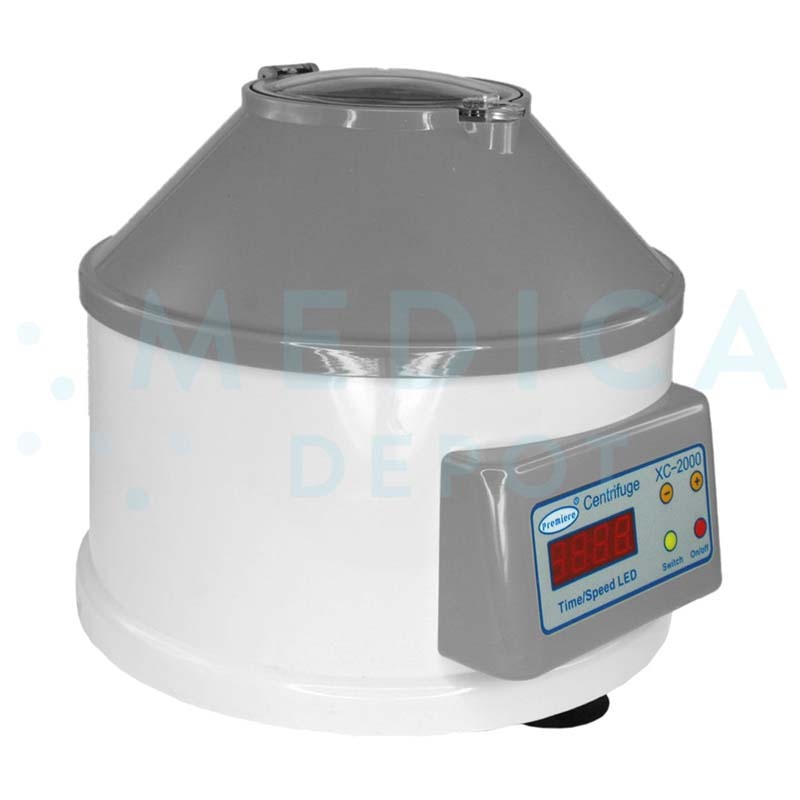 You can order Plasmolifting Centrifuge XC 2000 online from MedicaDepot.com or by calling our friendly customer service associates. When you buy wholesale Plasmolifting Centrifuge XC 2000 from Medica Depot, you can offer PRP therapy to help improve your patient’s skin condition. The item is a centrifuge with a rotor for six tubes (10ml – 15ml). A product insert is also provided. This centrifuge is a required equipment for carrying out the Plasmolifting method of preparing PRP. This centrifuge provides the necessary separating force for blood samples in a Plasmolifting tube to fractionate into distinct components, including the desired platelet-enriched portion. The instrument features a memory function and one-touch programming of time and speed settings. The Plasmolifting protocol is design to prepare high quality PRP for therapeutic purposes. PRP is used in a wide variety of treatments in various medical fields including sports medicine, trauma, and aesthetic medicine, and is valued for its ability to encourage and enhance wound repair and tissue regeneration. The substance contains a high concentration of growth factors and cytokines which are involved in inflammatory processes and cell proliferation. When administered to the skin, PRP can help in skin resurfacing, removing signs of aging such as wrinkles and skin laxity. Place sample tubes in the centrifuge, ensuring that the tubes are properly balanced. Single sample tubes should be balanced by a tube of equal volume (filled with a liquid e.g. water) placed directly opposite the sample tube in the rotor. If the sample tubes are too short for the tube holder, use the provided manufacturer’s soft foam to fill the holder to ensure a tight fit. Centrifuge the samples for five minutes at a speed of 4000rpm. Use the one touch switch panel to set the time and speed, or use the memory setting to use the previous setting. Begin the centrifugation step by pushing the start button. After the centrifugation step, the processed sample should have separated into distinct layers, each corresponding to a different blood portion, including the desired platelet-rich plasma (clear yellowish fluid). This layer can be extracted by withdrawal into a syringe and is suitable to be used on the patient immediately. PRP therapy is administered in multiple treatment sessions in order to obtain the best effects. Depending on the indication, between two to ten sessions, administered in seven to ten day intervals, may be required. Each treatment session takes no longer than half an hour, including the time needed for preparation of PRP for injection. When PRP therapy is used for skin rejuvenation, suitable treatment areas include the face, neck, décolletage and the back of the hands and feet. The biorevitalizing effects provided by PRP therapy are long-lasting, usually resulting in long-term durations of up to 18 months. The duration of results varies by skin condition and by application. PRP therapy is appropriate for patients exhibiting signs of skin aging including wrinkles, loss of elasticity, and thinning or crepey skin due to loss of texture and tone. This aesthetic treatment is also suitable as adjunct therapy administered to enhance the results obtained from other aesthetic procedures such as dermal fillers, laser treatments, or dermabrasion. Plasmolifting equipment like the Plasmolifting Centrifuge XC 2000 is certified and approved for the preparation of PRP using the Plasmolifting method, a simple protocol that generates highly purified PRP quickly and efficiently. Generally, adverse effects associated with PRP use are minimal as the injected substance is autologously derived. After PRP therapy, patients may experience certain injection-related reactions at the treated site, including bruising, tenderness, swelling and redness. These reactions are temporary and often resolve on their own within a few days after treatment.